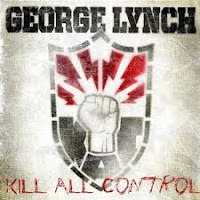 RockUnitedReviews: GEORGE LYNCH: "Kill All Control"
GEORGE LYNCH: "Kill All Control"
Hey, look everybody, it's Mister 'I-hate-the-80s' and will bite the hands that's been feeding me ever since the.... well, the eighties. Yep, George Lynch of Dokken fame, a bunch of ugly/dirty metal heroes that were constantly fighting among themselves and managed to record a couple of smashing albums inbetween all the bickering. I believe he proudly did a bonfire of all his eighties stuff and thought of his old fans as retards for ever liking the music? Yeah, please do correct me if I'm wrong? but I believe there's still photos of the event on the web? Here's a question for ya', would anyone care about George Lynch today if he didn't have a successful career in the eighties?? No... of course not. Biased? grudge? bitter? Heh, well, at least I didn't hand out a "zero" rating of, "Kill All Control", since we're all about the music at RockUnited.com. But, if there's one thing I hate, people who complain about their past success just because they don't have the spine to stand up against the-so-called popular movement at a particular moment in time. Lynch decided to bring in several different lead vocalists on this record (BulletBoys' Marq Torien, Keith St. John and London Le Grand, etc). and the result is at times quite pleasing, but hardly full filling. One thing's for sure, Lynch and co. aren't poncing around on his new record. Once and possible always in the past/last 15 years criticized for making second rate Alice in Chains melodies. "Kill All Control" manages to combine some better melodies and longer guitar solos than ever before in his solo career (well, since the first Lynch Mob). However, don't go thinking it's back to the eighties as several tracks (such as "Voices in My Head", "Man On Fire", "My Own Enemy") are still Alice In Chains lite, but I quite enjoy them. Sadly, overall, it's too much about 'groove' and not enough 'hooks'. The soaring guitars solos alone are not enough to convince me... even though it's a relief after all the albums without them. Decent and George Lynch fans pretty much know what to expect by now anyhow. Highlight, the instrumental, "Son Of Scary"... very "80's", very scary. BRONZ: "Carried By The Storm"
BAD COMPANY: Live At Wembley"
SLIDESHOW: "Heroes On Your Ceiling"
FORNOST ARNOR: "The Death Of A Rose"
MICHAEL ON FIRE: "Always Yes"
RED QUEEN THEORY: "Red Queen Theory"
ENSPIER: "The Hall Of Mirrors"
WE DIE TONIGHT: "Stem The Tide"
TROUBLE TRIBE JAPAN: "Supersonic Stare"
VON HERTZEN BROTHERS: "Stars Aligned"
JOHN WETTON: "Raised In Captivity"
ENDLESS MAIN: "Sea Of Lies"
AIRRACE: "Back To The Start"
PAUL SABU: "Call Of The WIld"
IF ONLY: "No Bed Of Roses"